CAVENDISH—The Town of Cavendish has discussed “going solar” for several years and has finally reached the turning point. 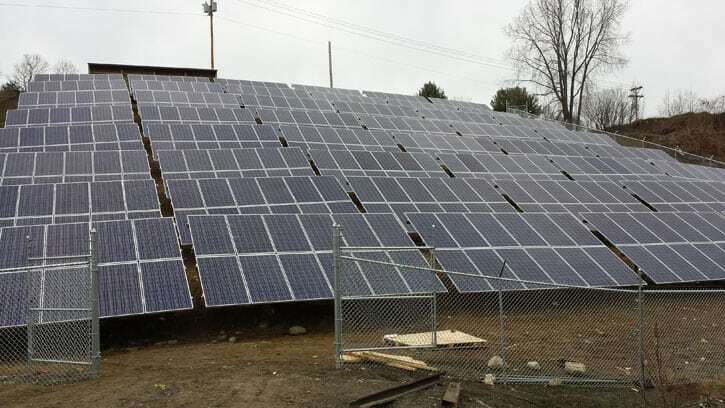 After much planning and discussion, and after much very hard work, the town-owned solar array has gone on-line and is now feeding electric power into the grid to support Cavendish municipal buildings and facilities, town officials announced in a Jan. 16 news release. To celebrate this watershed event, the town will hold a grand opening celebration and ribbon cutting at the new Cavendish municipal solar array on Monday, Feb. 9 at 11 a.m. All citizens and residents of Cavendish are invited to attend. The ceremonies will begin at the solar array site, which is located off Power Plant Road next to the wastewater treatment plant. After the ribbon cutting and remarks by the assembled dignitaries, there will be a reception with light refreshments at the Cavendish town offices, 37 High Street. The solar array is designed to produce 148 kW of AC solar power as a net-metered system. The array feeds all electricity that it generates into the electric grid, and Green Mountain Power offsets that generated electricity against the electricity used by the town offices, the transfer station, the water filtration plant and the wastewater treatment system. For more information about the celebration or about the Cavendish solar array, please contact the Cavendish town office at 802-226-7291. For planning purposes the town requests that those who plan to attend, please RSVP to cavendish[space]solar@CavendishVT.org.